ABS-CBN just released a statement regarding the garnishment of assets of ABS-CBN and Sky Cable which was ordered by the Mandaluyong Regional Trial Court last May 25, 2017. The statement indicates that ABS-CBN and Solar Entertainment Corporation went into a license agreement with NBA Properties Inc. and since ABS-CBN was already paying 60% of the dues for the licensing, they assumed this to be part of the carriage fees which Solar Entertainment Corporation disagreed with. 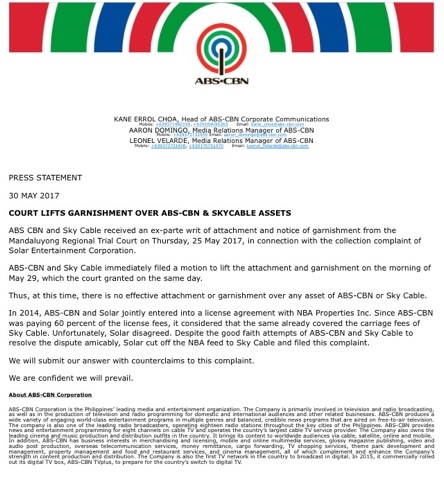 On the note, it indicated they have pursued several attempts to resolve this amicably but Solar has already cut off its feed to Sky Cable and filed this Garnishment claim. Garnishment is a legal term of collecting monetary judgement in behalf of the plaintiff - in this case is Solar Entertainment Corporation but ABS-CBN has filed a motion to lift on May 29, wherein it was granted on the same day. They also indicated they will file counter claims and are confident they will prevail in this case. Bless them both, we guys just need our NBA back especially since it is already championship already.